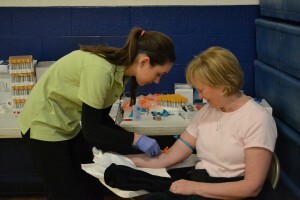 On the first Saturday in March, the Chamber organizes a Community Health Fair that offers free screenings, valuable medical information and demonstrations. This annual event gives the public an opportunity to discuss everything from health insurance to gym memberships; from caring for the elderly to medical equipment. Consistently, over $500 of screenings are provided to attendees free of charge. Fill our the form below or download the form below..
We will provide a door prize for the Health Fair. By checking this box, I agree to the terms of the event.